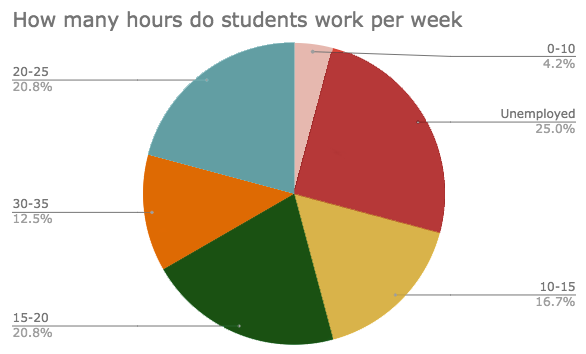 "Teens at LHS and their work hours"
At Lakewood High School, 75% teens are employed. Of these employed teens, 33% work more than 20 hours per week. This is far higher than the US average, which, according to the US Department of Labor, is close to 38%. This employment rate among teens has been on a gradual decline since 1980, when over 56% of teens were employed nationwide. There are explanations for the rise in unemployment. School is getting more difficult, more students are attending college, and it is getting more expensive- and a part-time job is not enough to cover it, so students tend to take out loans instead. For high school students, the unemployment rate seems to be related entirely to class work load. However, other students, even those working upwards of 20 hours per week, have said that working forces them to manage their time better. Another student, who works 15-20 hours per week, has said that having a job helps them balance their life. As discovered in a small survey amongst seniors at LHS, unemployed teens at have an average GPA of 3.5, where as teens with jobs have an average GPA of 3.3. Having the spare time to do things like homework and study has a positive impact on grades and academic performance.